Here at SampleBoard, we have been gushing over Maja’s beautiful design boards she’s continued to build over the years and wanted to learn more about her design process, her inspiration, the way she structures her e-design service using mood boards, and what is it that makes SampleBoard such a significant part of her e-design business. “SampleBoard has allowed me to get through projects more quickly. It has also helped me to secure more jobs as potential clients have been able to get a quick read on my design style through these boards”. 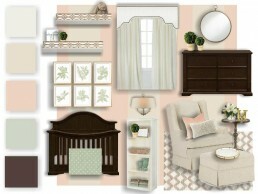 Maja Bacon is the owner and designer of Bacon Bits Interiors, specializing in nurseries, kids’ rooms and family spaces. Ever since Maja can remember, she’s had an eye for design. While she was just a little girl, she used to mentally rearrange the furniture to what she felt would be a much better layout. She is truly passionate about what she does and enjoys providing every project with an unusual and unique touch. Maja puts her heart and soul into creating dreamy spaces for little ones, yet managing to keep them cool enough for adults to enjoy too. When designing rooms for kids, what Maja finds most inspiring is the opportunity to let your imagination loose and play around with endless possibilities and color palettes. And when designing a nursery, a privilege of being a small part of a family’s life just before their precious new member arrives is what Maja considers to be the most rewarding. Kids’ interiors are Maja’s biggest passion, but she is also known to design bedrooms, dining rooms, and even man caves! At SampleBoard, we love Maja’s creative philosophy, as clearly represented in her design boards. Based on two simple principles, Maja believes that the space you live in should be an extension of who you are and make you happy and that you should be able to have the space of your dreams regardless of your budget. Maja strongly feels that great design should be fun, light-hearted and accessible, and we tend to agree! As part of Maja’s design process, clients complete an email questionnaire which covers budget, design style, specific needs or requests and provides some pictures for inspiration. She considers Pinterest to be of great help in learning more about the client’s preferences, but she also looks for pictures of spaces the client dislikes as they can be an invaluable part of the design process, eliminating potential hours spent heading down the wrong path. As part of the e-design service, the client receives a floor plan of their space, design boards with a detailed product list, design notes and instructions for pulling everything together and, if needed, ongoing consultations until the room is complete. Customized design boards include all the information about selected paint colors, furniture, lighting, rugs, art, bedding, window treatments, and accessories. Maja lets her client know what the items specified in the design board cost and where to find them. She adds no markup, and there are no hidden fees, so customers can shop for the best deals, liaising with Maja until they are enchanted with the result. It all comes in the form of a neat little package – Bacon Bits Box, or how Maja likes to call it client’s little bundle of design joy. Before utilizing SampleBoard as her principal means of mood board creation, Maja was using an interior design app, but she found it limited in its capabilities. It was then that Maja realized there had to be an easier way to create professional design boards for her clients, her e-design business depended on it. After googling different programs, she came across SampleBoard. Maja found it very easy to get started. A quick review of the help desk articles was all she needed to get cracking on creating beautiful mood boards. She believes SampleBoard helps her create faster, simpler design boards, enables easier client collaboration and always ends up with professional results that delight her clients. As Maja is one of our Power Users, we were keen to find out what is the feature she couldn’t live without. Maja notes that it takes practice to produce high-quality mood boards like hers and that her boards have improved over time as she started to use more of the features regularly. Feedback is essential to design creatives, and when fellow designers ask for your guidance after seeing your work, you know you are on the right track. That was exactly what happened to Maja after she presented some of her mood boards made with SampleBoard. Created by designers, for designers, SampleBoard is so easy and intuitive; you’ll be sharing your first mood board in no time. Don’t believe us? Just ask Maja Bacon, or, better yet, try it free for 14 days and see for yourself.